is one of the most important crops in the world. It is an essential food for more than one third of mankind, especially in tropical Asia, where persistent cloud cover hinders the acquisition of useful optical imagery from space during the most part of the year. 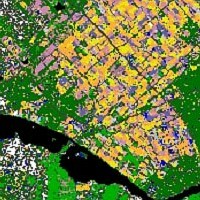 Spaceborne Synthetic Aperture Radar (SAR) such as the European ERS and ENVISAT, the Japanese JERS-1 and ALOS, and the Canadian RADARSAT enable to monitor rice growth and to retrieve rice acreage, using the unique temporal signature of rice fields, regardless of the weather conditions. 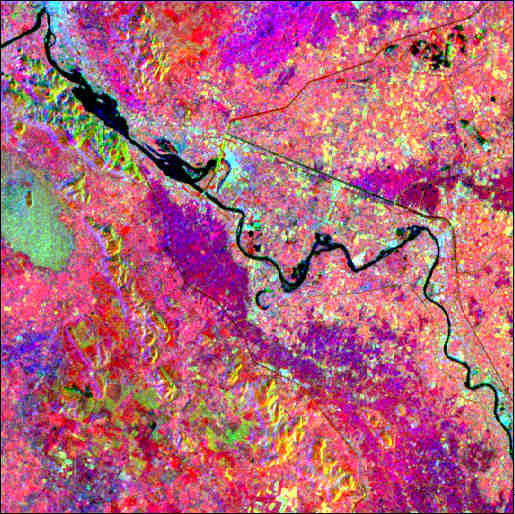 The multitemporal SAR time series (3 images, represented below in red, green and blue color composition) presented here has been acquired over Thaïland from August to December 1993, by the ERS-1 satellite of the European Space Agency (Original images: courtesy of Dr. J. Aschbacher). 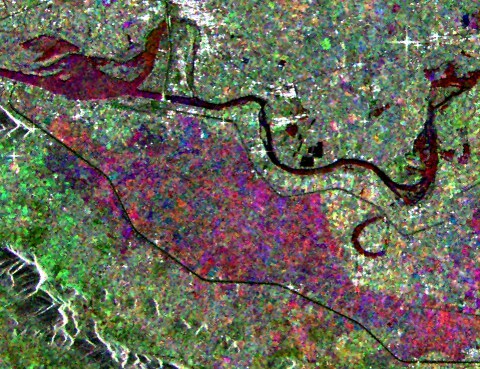 Adequate Privateers NV processing (image calibration, speckle filtering and classification method) and know-how (agronomy, radar physics) enables to extract useful information such as land-use, area of rice paddies, etc., from these satellite SAR images. The resulting classification can be used to forecast the rice production, thus getting a valuable economical information, exploitable either for agriculture management, or on the stock exchange market. Rice fields (violet) exhibit a characteristic temporal response to the radar wave. The 3 ERS images have been filtered using the Gamma-Gamma MAP adaptive speckle filter. The imaged area covers 19.2 x 17.6 km. Much better results can be achieved, using the synergism of optical sensors (Here, the Japanese MOS-1) and SAR sensors (here the European ERS-1 (C-band) and the Japanese JERS-1 (L-band) SAR's). The methodology used to finally obtain this classification derives from Privateers NV R&D carried out in 1996/1997. In this classified image (shown area covers 26x26 km), rice, sugarcane, cassava, sunflower, maize, pineapple, plantations, and forest are identified (for commercial reasons, year and legend are omitted and spatial resolution has been degraded). E. Nezry, F. Zagolski, A. Lopes, F. Yakam-Simen: "Bayesian filtering of multi-channel SAR images for detection of thin details and data fusion", Proceedings of SPIE, Vol. 2958, pp.130-139, Sept. 1996. E. Nezry, F. Yakam-Simen, I. Supit and F. Zagolski: "Retrieval of environmental and geophysical parameters through Bayesian fusion of ERS and RADARSAT data", Proceedings of the 3rd ERS Symposium, Florence (Italy), 17-21 March 1997. For the first time in Europe, the real-time, early in the agricultural season (winter) , acreage estimation of economically important crops (cereals, etc.) and of non-cultivated (set-aside) land in Europe has been successfully carried out under Privateers NV leadership and management. Operations were conducted during from November 1994 to February 1995 (Test areas in Spain, Italy, France), using ERS SAR images and a similar methodology in the framework of the ERS-1 (ESA) Pilot Project PE-FRNE. Readers may redistribute this homepage and its locally linked pages to other individuals or institutions for noncommercial use, provided that the text, all html codes, and this notice remain intact and unaltered in any way. No component of this homepage and of its locally linked pages may be resold, reprinted, or redistributed for compensation of any kind without prior written permission from the ParBleu Technologies Inc.